Our beliefs strongly influence our behavior. They motivate us and shape what we do. For instance, it is difficult to learn anything without the belief that it will be pleasant and to our advantage. What are beliefs? How are they formed and how do we maintain them? 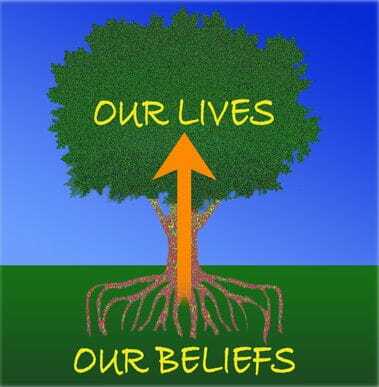 Beliefs are our guiding principles, the inner maps we use to make sense of the world. They give stability and continuity; they are stable data that helps us to make order out of confusion. Shared beliefs give a deeper sense of rapport and community. Beliefs come from many sources - upbringing, imitation of significant others, conclusions as a result of past traumas, and repetitive experiences. We build beliefs by generalizing from our experiences of the world and those of other people. Some beliefs come to us ready made from the culture and environment we are born into. When we are young, we believe what we are told about ourselves and the world, because we have no way of testing, and these beliefs may persist unmodified by our later achievements, because they had parental authority. We become predisposed to believing what we are told, what we read and what we see on television, and try to adapt new information to fit our existing system of beliefs if we can. If we cannot fit information to the existing pathways, we refuse to believe the information. These are the filters and biases through which we perceive our reality. When we believe something we act as if it is true; we have then made an investment of effort. This makes it difficult to disprove; beliefs act as perceptual filters - events are interpreted in terms of the belief, and 'exceptions prove the rule.' Beliefs are not just maps of what has happened, but blueprints for future actions. Positive beliefs are permissions that turn on our capabilities; they are permissions to play and explore in the world of possibility. Limiting beliefs on the other hand, usually center around, 'I can't...' This may have seemed a valid statement at the past moment in time, but believing it is a description of your capability now and in the future will program your mind to fail, as it will prevent you finding out your potential capability. Beliefs can be a matter of choice. They change and develop; we have new peers that we listen to, new authority figures and influences. We think of ourselves differently, we marry, divorce, change friendships and act differently because our beliefs change. We can create new limiting beliefs or we can create new empowering ones; our life is not fixed in stone - we retain our freedom to choose. We have each created many beliefs about our possibilities and what is important in life, and we can change them. Beliefs do not of course just apply to other people's statements or to dogma, they may apply to our own judgments about other people and situations... "This is intolerable!" "I can't stand this any longer!" "She is simply awful to be that way!" "Everybody's against me!" When they are exaggerated and over-generalized, they are irrational and harmful beliefs to hold. In particular, they are self-defeating. Our interpretations drive our emotions. When we have habitual interpretations they become beliefs that we identify with, and then our emotional responses become equally fixed and often highly stressful and inappropriate, and our actions follow suit. We all do things we aren't proud of, we wouldn't be human if we didn't. Something that affects others in a way that we wouldn't be willing to experience ourselves. Sometimes we chose to act in a way that we know at the time isn't being true to ourselves, but it seems like a solution to our situation. Or maybe we are tempted to put our own interests first. Other times we may be carried away by emotions of anger or jealousy and do something out of spite we may later regret. Or we don't do something, like helping a friend in need, which we know we really wanted to. Alternatively we may have the best of intentions, but things don't go as predicted, we make a mistake or realize something we have done was harmful, even though we didn't mean it to be. These sorts of actions can leave us feeling ashamed and depressed, and we can end up carrying our guilt for years, but if we want to live happy lives, we need to take responsibility for the consequences of our behavior and move on. Feeling guilty shouldn't be confused with taking responsibility for our past. Responsibility means that we make a concerted effort to change the behavior pattern that resulted in the mistaken choice, and the beliefs and feelings that empowered it. We need to move on by making peace with the past. The natural tendency when we do something without integrity is to try to justify our actions, to make ourselves right. Or we may say the action was deserved, making the other person wrong. Both of these are avoiding the reality, by denying our own sense of truth and our own responsibility for our actions. We avoid our feelings of guilt by pretending it wasn't a mistake or misconceived choice that we acted on, indeed it was 'right.' We avoid our feelings of shame (feeling bad about how others perceive us) by pretending that it is the other who should be ashamed. The problem isn't the harmful action or making a mistake - that's happened and can't be undone. The problem is what we tell ourselves afterward. Whether we are honest or if we lie to ourselves. It is that lie which causes all the damage to our own integrity and to further relationships with the other we have wronged. We need to drop our defenses, drop the lies we may have told ourselves to hide the truth, face up to the reality of our actions and their consequences - and forgive ourselves. There is a big bonus to being realistic and truthful - we can learn the valuable lesson that the experience offers us. Indeed, it's only when we have learned that lesson that we can let go of the past error and live our life as truly ourselves in the present. To forgive ourselves we need to learn the lesson. Forgiveness has nothing to do with feeling sorry or apologizing, neither of which actually changes anything. From a higher perspective there is no right or wrong. There are choices and experiences. There is cause and effect. And neither can forgiveness be given by another; it has to be granted by ourselves. Unless we can truly forgive ourselves, we can never really move on and be free of the past. What gets in the way of this forgiveness is judgment that I am a bad person. I need to separate my inherent worth from my actions. I am basically a loving being, I know that. We all are. Actually I am not even my thoughts and feelings. I create these and sometimes through ignorance or misguidedly I create them inappropriately, and my consequent actions can result in hurt for others. Then the best I can do is to learn from that so in the future I can create more truly to my nature. I need to realize that my earlier choice was a result of my ignorance - I didn't know what I can now see to be the lesson from the experience. Personal transformation occurs when we free ourselves to reflect upon and revise our beliefs. This becomes easier to do when existing solutions, assumed truths and past decisions have been exposed as unrealistic and self-defeating. That's why each error, mistake or failure that we make presents an ideal learning opportunity. Life is a journey of learning and the most worthwhile learning is derived from our personal experiences. When things go as we want, because we have good information and appropriate beliefs, then our learning is reinforced by this positive feedback. When things go astray, because we have faulty information and inappropriate beliefs, then we and those at the effect of our actions suffer. But here we have a chance to learn something new. Much of our new learning and personal growth does therefore come about as a result of painful experiences; provided we are willing and open to learn those lessons. If we wish to grow and to use our experiences beneficially, it is vital that we focus on what we can learn rather than resisting the reality of what occurred. Find something you did (or failed to do) that you still feel bad about, which you regret, or that makes you feel ashamed. Now begin to take meaning and value out of this experience. Ask yourself: "What has this taught me about myself, about others, and about my life?" Based on this lesson, work out what beliefs you need to change, what fixed ideas you can let go of, what assumptions you made before that are no longer helpful. Peter Shepherd is the founder and producer of the Trans4mind personal development website. A transformational psychologist by background, Peter is author of 'Transforming the Mind' and 'Daring to be Yourself.' Get in touch with Peter Shepherd here.